I smell spring! How nice it is to feel a warm breeze on your face and hear the birds chirping again. I feel like a new person with revived energy and a skip in my step. I’m through with warm stews and hot tea and more than ready for fresh, lighter meals. 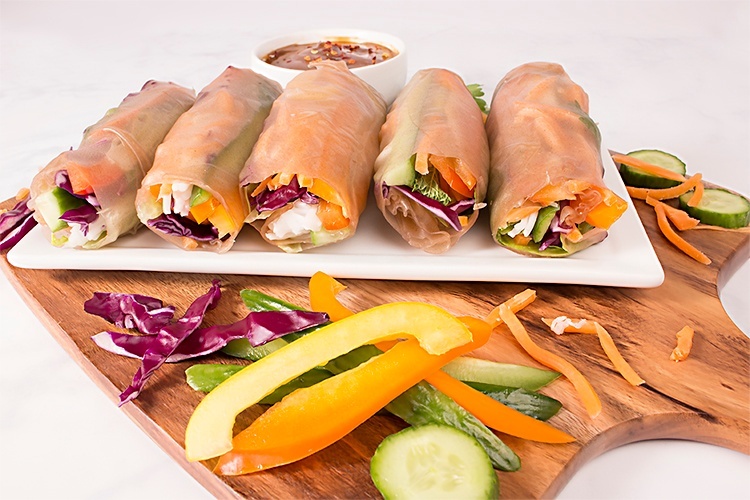 This spring, I’m loving Fresh Spring Rolls... fitting right? I brought these to a ladies lunch recently and they loved them. 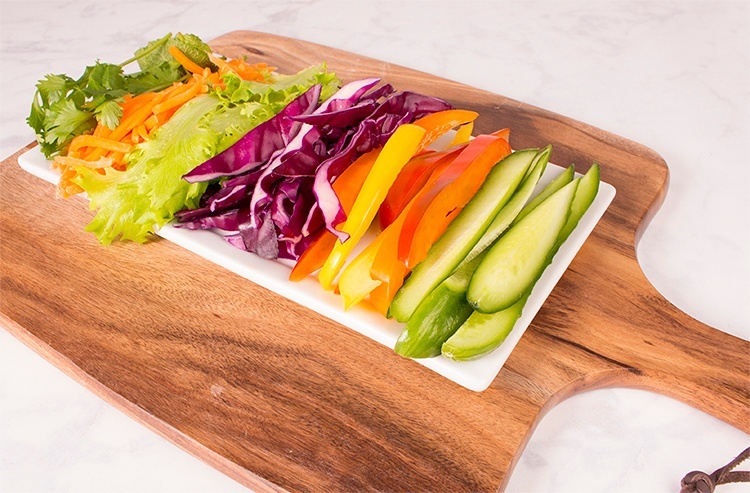 Finally, a salad that you can eat with your hands! I was definitely intimidated by the rice paper’s fragile appearance, but they were much easier to use than anticipated. You can put whatever you would like in them and even make this a fun activity with the kids. This is my favorite go-to recipe. You can always add some protein like shrimp, tofu, or chicken if you’d like. Happy Spring (rolling)! Cook the rice noodles according to the package directions and let cool. Whisk together the ingredients for the sauce in a small dipping bowl. Assemble the spring roll by placing very hot water in a large shallow bowl; immerse the rice paper for about 10 seconds to soften. Transfer the softened rice paper to a damp surface, like a cutting board and make sure it is spread out in a circle. To the bottom third of the rice paper (closest to you), add equal amounts of the rice noodles, leafy greens, purple cabbage, carrot, cucumber, red bell pepper, cilantro and mint, until you have a small pile centered in the bottom third of the rice paper. Fold in the sides of the rice paper and roll from the side closest to you, being sure to tightly pack the fillings within the roll. Place on a serving platter and cover with a damp towel to keep fresh. Repeat for the rest of the spring rolls. Serve with the Peanut Sauce. Leftovers can be stored separately in plastic wrap, but definitely best when served fresh!